As a prelude to the traditional patriotic pilgrimage of the Holy Week which welcomes more than 10,000 young people coming from the different localities of the Great North, Marie Christine Stephenson, the Minister of Tourism, accompanied by Jean Reynaldo Brunet, the Minister of the Interior and the Territorial Collectivities, organized a round table with all key players in the North involved in the Management of the National Historical Park (Sans-Souci Citadelle) involved in the organization of this major event. Various topics were discussed including, among others: security, health, cultural activities and visitor flow management. Arrangements have been made to ensure that the Territorial Communities fully assume their roles in the perspective of this annual event. 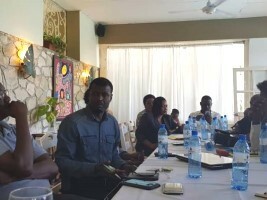 In addition to representatives of the central government, were present around this round, the Departmental Delegate of North Antonio Jules, the Mayors of Milot, Dondon and Plain of Nord and a representative of the Provisional Management Authority of the National Historical Park. More work sessions are planned at the beginning of this week in order to generate a positive synergy necessary for the success of this activity.